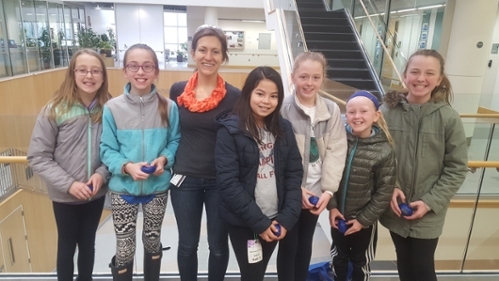 A local entrepreneur club comprised of fifth graders interested in science and the business aspects of science recently contacted the Benoit lab after conducting one of the outreach experiments the lab shared online. 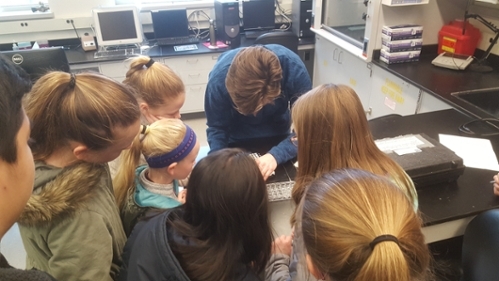 The module demonstrates diffusive drug delivery through hydrogels, and they were interested in conducting another hands-on demonstration alongside the scientists behind the activity. Professor Benoit invited them to the Benoit Lab, where they met with lab members, took a mini tour, attended a presentation on hydrogel mechanics, and did some hands-on mechanical testing of hydrogels. The takeaway: gels made with lower weight percents are softer, and gels made with higher weight percents are stiffer, allowing us to tailor hydrogel constructs for our desired tissue engineering applications.